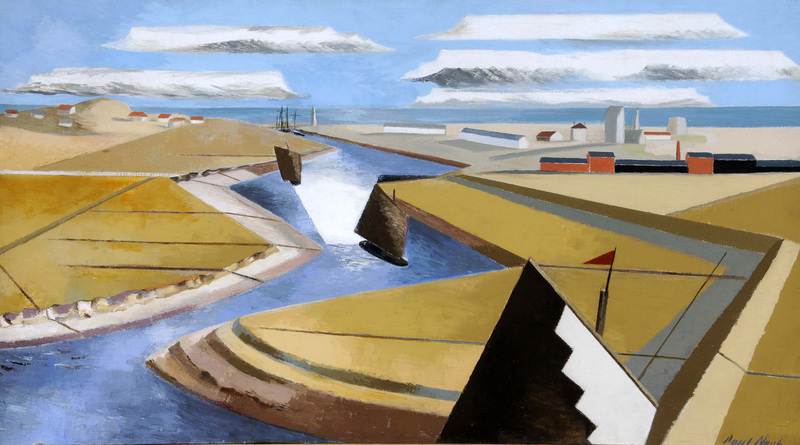 Nash carved out visionary landscapes from places that held personal significance for him: Buckinghamshire and Dorset, Sussex and the South Downs. He focused not just on what can be seen but what can be inferred and imagined: the landscape’s natural rhythms and deep history, which he interpreted according to his personal mythology and beliefs. 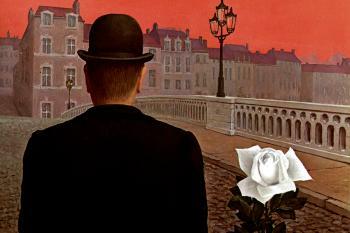 The result was a series of paintings with a powerful emotional undertow; his art can be observed but also keenly felt. Critics often reduce his work to its essential Englishness. But while he took inspiration from mythic Albion, Nash was anything but parochial. Tate Britain’s retrospective returns him to his rightful context: as an artist working within the flourishing international modernist movement, trading techniques with those on the continent and bringing surrealism to Britain. 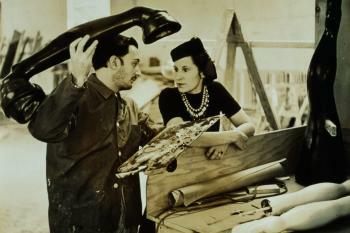 Alongside Nash’s paintings, the exhibition features the work of Unit One, a group of surrealist artists he founded. It was a short-lived venture, but it had a prodigious output, and helped establish the careers of British modernists like John Bigge and Henry Moore. Together with his lover, Eileen Agar, he began to experiment in new media: assemblage, collage and photography. He helped organise the International Surrealist Exhibition in 1936, which brought to London the key European modernists, including Picasso, Dalí, Giorgio de Chirico and Max Ernst. The works Nash completed after the exhibition fizz with energy, deploying new symbolist and abstract methods to radically refashion the English landscape. By the time the world exploded into war several years later, Nash had created a new language with which to describe its horrors. Nash was fascinated by the idea of the “genius loci” or “spirit of place”, an ancient belief that the landscape possesses a primordial, mystic life-force. This spectral early watercolour features the three elm trees at the bottom of his garden in Iver Heath. 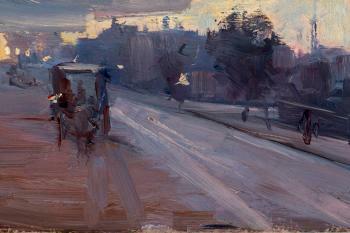 Using a monochrome palette, Nash captures the dramatic character of their single canopy, silhouetted against the sky. 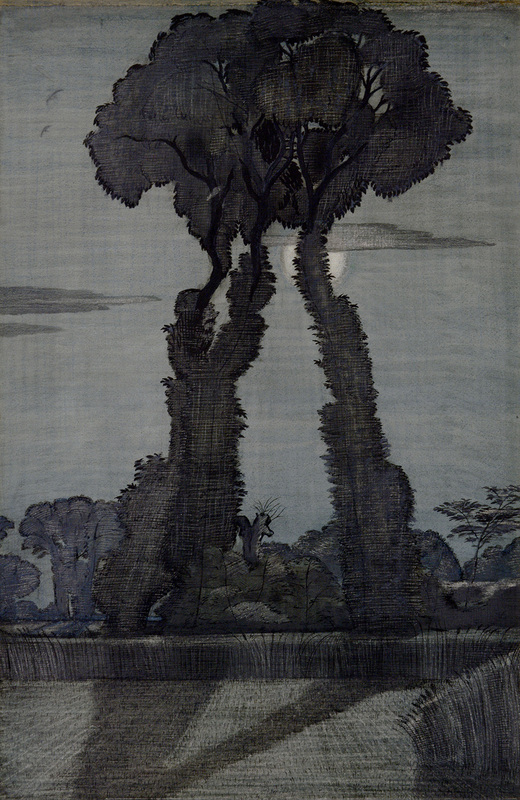 It is reminiscent of the fantastical etchings of Samuel Palmer: the interlacing trunks form a tripod-like structure which dominates the otherwise empty, moonlit field. 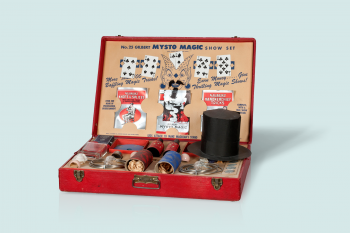 Here as in his later works, Nash uncovers the potential for mystery contained in the English countryside. 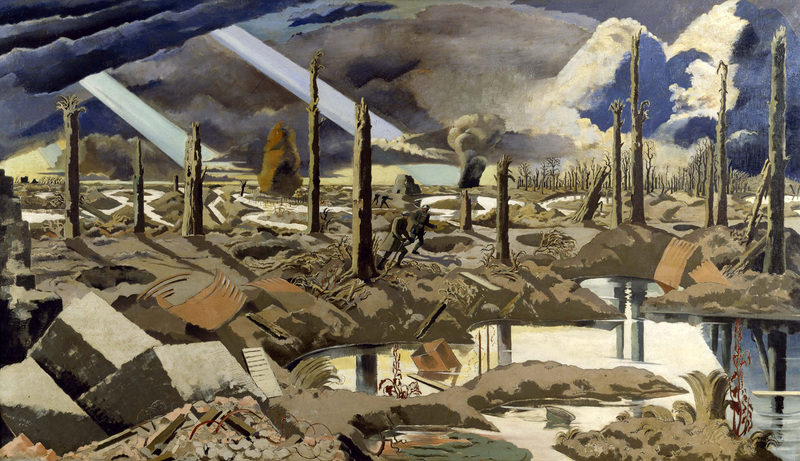 Nash is primarily remembered as a war artist and his experiences on the frontline at the Ypres Salient, where he was posted in March 1917, produced vivid and often alarming works like “The Menin Road”, a memorial painting commissioned by the Ministry of Information and Canadian War Records. The work is an expansive mudscape, cleaved by the violent criss-crossing of trenches and shell holes, while up above shafts of purple light tussle with clouds of pallid yellow smoke. Nash’s deft layering of oil paints, a medium he first adopted during wartime, lends the battleground a shattering immediacy. 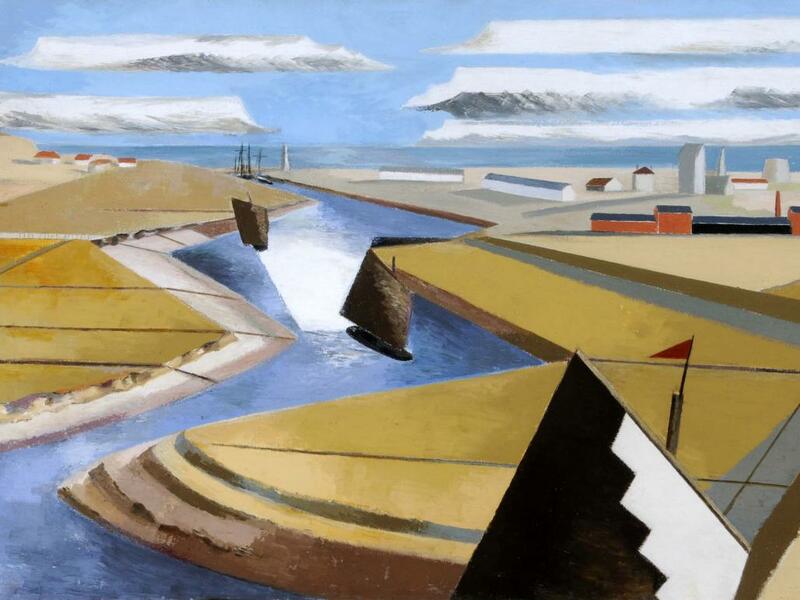 Nash’s treatment of Rye Harbour marks the beginning of a radical new approach to landscape. Flattened clouds lie heavy upon the sea which slides down the work in an angular river channel. Ambiguous lines slice through the empty fields. The blocks on the cliff tops resemble little Lego-brick houses, colourful but characterless. Nash assembles his picture from repetitive shapes and simple but surprisingly evocative forms. The result is severe and uncompromising, abstract but without the mythical energy that flows so freely through his pre-war works. Nash was entranced by the Avebury stone circle in Wiltshire, which became the subject of increasingly surrealist landscapes. 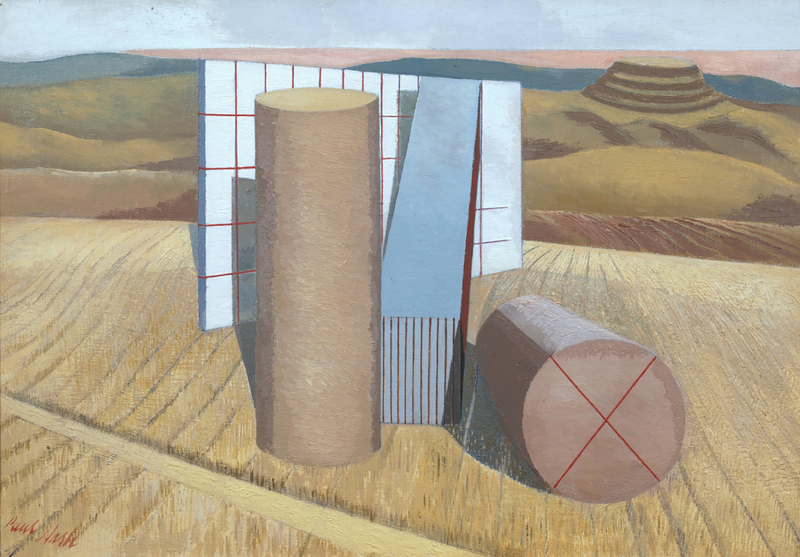 Here the standing stones have been transformed into a collection of geometric forms, startlingly incongruous with the rolling yellow fields that surround them. In his journals Nash wrote of the “wonderful and disquieting” effect of the megaliths, an alien presence on the landscape that has nonetheless been absorbed into it. By using symbolic equivalents Nash is able to arouse in the viewer the same powerful feelings of confusion he felt when looking at the stones, enhanced by his arrangement of the objects at opposing angles. Nash was designated an official war artist at the outbreak of the second world war; “Battle of Germany” soon followed. 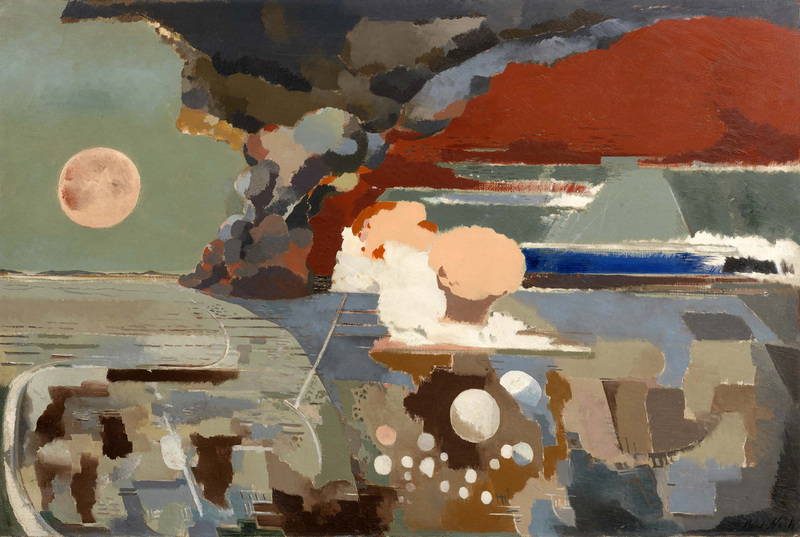 In “Aerial Flowers”, an article published in the same year, Nash explains how the war inspired him to produce startling aerial landscapes like “Battle of Germany”, a surreal depiction of bombardment from above. On the right is the cataclysm of war, conveyed in hurried splotches of black, brown and blood-red; on the left, a silent landscape and stilled air, empty apart from a weak yellow sun. 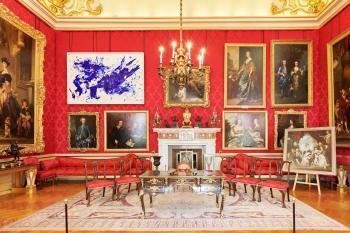 The work is full of doom, but there is also an exhilarating feeling of artistic possibility. His fascination with aerial bombardment led Nash to an ecstatic vision of “the sky blossoming with floating flowers”. 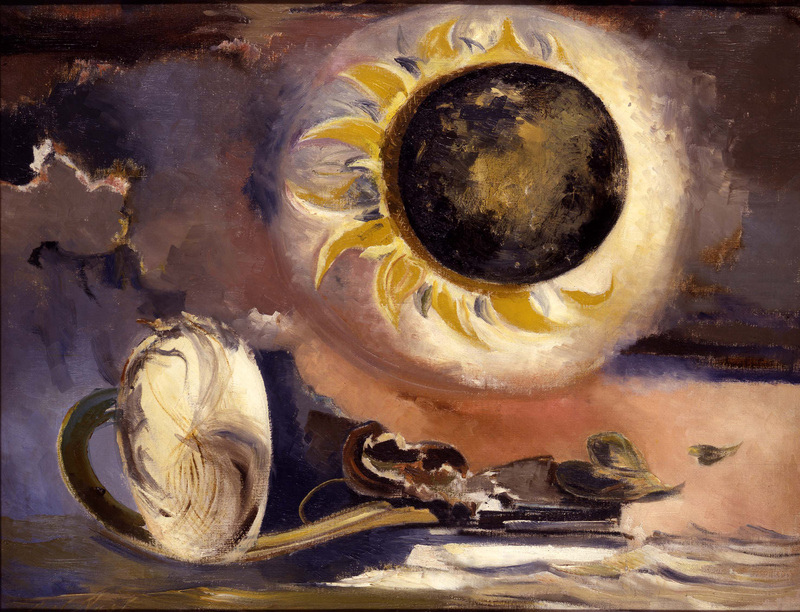 This, and William Blake’s poem “Ah Sunflower”, inspired his late paintings, in which an airborne sunflower glides over imagined landscapes. Nash was seriously ill with asthma (he died of heart failure in 1946) and his growing sense of mortality is reflected in this final work. Broken from its stem, the blackened head of the sunflower and its wilting petals fall away into the smoky darkness. 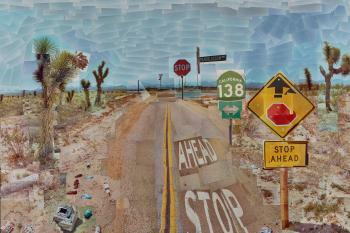 But Nash’s belief in the mythical cycle of death and rebirth gives the viewer a cause for hope. The flower’s head detaches from its stem like a spirit departing from the body.